Microsoft Outlook is a part of Microsoft office suit developed by Microsoft. Outlook is also known as personal information manager and used by several organizations. Generally, it is used as an email application and contains elements like task manager, calendar, journal etc. This software contains an inbuilt tool like Scanpst.exe (Inbox Repair Tool) widely used to repair and resolve the minor issues of Outlook. What is Scanpst.exe (The Inbox Repair Tool) ? Scanpst.exe is an Inbox Repair Tool that is also referred as Inbox Repair Tool which is used to resolve the errors or minor issues of MS Outlook. This tool is efficient, effective and time saver that perform several difficult operation in order to resolve the outlook issues. This tool has the ability to troubleshoot Outlook errors and also provide a hassle-free recovery of file items. This tool quickly fix the problems when user cannot open personal folders or Outlook did not load properly. It also helps to fix the error locating the path to a PST file or if the data file get crashed during launch. Additionally, Scanpst.exe is used to identify and diagnose the problems regarding PST files. This tool detects the error location to the PC and looks for the personal folder files in order to determine whether the data has been damaged or corrupt. In case of any error, this tool reconstruct the header and correct the error. This tool is available in approximately all the versions of Microsoft Outlook that includes Outlook 97-2002, outlook 2007, Outlook 2003 and Outlook 2010. The Inbox Repair Tool can be launched by executing scanpst.exe file. You can find the location of this file on almost all the versions of Outlook and also its location depend on its installation on different versions of Windows operating system. 1) Problems related to oversized Outlook PST file – This Scanpst.exe stopped working and throws an error when you try to scan an oversized Outlook PST file. 2) Virus or malware attack – The other reason is the insertion of dangerous virus or malware into the PC on which MS Outlook has been installed. 3) Faulty installation of Inbox Repair Tool – If this utility did not get installed properly then further it may lead to the corruption. 4) It also get corrupt or damage due to exchange server problems. In order to get rid of Outlook errors you need to delete all attachments, contacts, calendar elements, unwanted emails, tasks, notes etc. You are also required to minimize the size of PST file. If you still failed to rectify and resolve the error then it is highly recommended to use third party “Outlook Email Recovery Software” that is used to repair or recover the PST file and other attributes of Outlook damaged due to some sort of corruption. 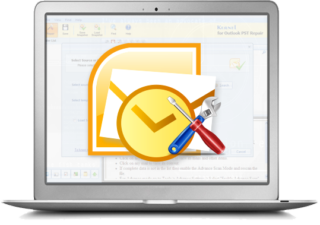 This software thoroughly scan the corrupt PST file and further restore all the components of Outlook like Journals, RSS feed, Calendar, Tasks etc. 1) This software is designed to fix all the issues of MS Outlook and fix PST files of several Outlook versions that includes MS Outlook 2003, 2007, 2010, 2013 and 2016. 2) This software also supports working on various Windows operating system like Windows Vista, Windows 7, Windows 8, Windows 10. 3) It performs effective Outlook PST recovery by scanning the damaged or corrupt PST files and restore all the recovered mail items to a new PST. This software provide the recovery of every single piece of information exists in Outlook data file such as calendar items, attachments, emails, notes and journals. 4) This software has designed in such a way that it can repair and recover data from an encrypted or a password protected file. 5) This software provide a deep scan of all damaged or corrupt items of Outlook. Before initiating the Outlook PST recovery, the software show the preview of all scanned items so that user can easily choose the item they want to recover. 6) This software also supports the recovery of accidental deleted emails from Inbox as well as deleted item folders. 7) It provides different file formats to save the recovered data item according to your requirement. Some of the file format it supports are RTF, MSG, PDF, HTML and EML. If you are looking for an effective recovery software in order to recover the corrupt, damaged, formatted Outlook PST file and other attributes then use third party Outlook Email Recovery Software which is available on our website. Our website provide both the trial and licensed version of this software. Its trial version will provide the preview of scanned files and after product purchase, you can save the repaired or recovered PST file.